Paul Gauguin Cruises offers SCUBA diving in Tahiti and French Polynesia from the 332-guest m/s Paul Gauguin. As the French Polynesia specialists, Paul Gauguin Cruises is uniquely positioned to reveal the wonders that await in the translucent aqua lagoons and rainbow-colored coral reefs of the South Seas. During dives in the lagoons of Bora Bora and Moorea in the Society Islands, lemon sharks, black-tip reef sharks, manta rays, and sea turtles can be seen. In Rangiroa and Fakarava in the Tuamotus, hammerhead sharks, manta rays, dolphins, turtles, eagle rays, barracuda, and other fascinating fish species are often spotted among coral reefs and canyon passes–including Fakarava’s reef, a UNESCO-Classified Nature Reserve. In the Cook Islands, divers come across impressively large hawksbill turtles, white tip reef sharks gliding over the sea floor, friendly emperor angel fish, and occasional eagle rays. The Marquesas Islands are among the best diving spots in the world. The steep cliffs and caves off Nuka Hiva reveal a variety of unusual marine life, including hammerhead sharks, manta rays, moray eels, and scorpion fish. The waters off Tahuata feature an underwater wilderness of grey sharks, rays, and schools of juvenile fish dancing among predators such as giant trevally or tuna. 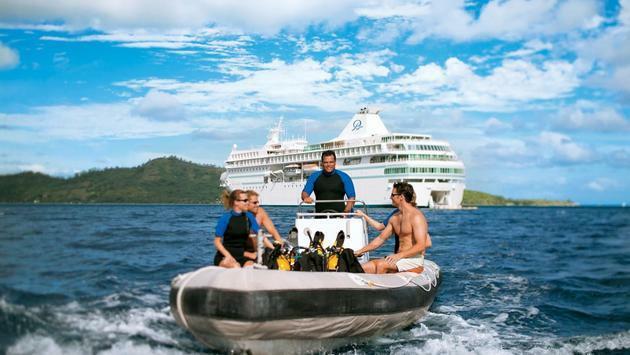 Every voyage of The Gauguin offers optional diving excursions led by an expert dive team. PADI certification is available on board The Gauguin, and dives are guided by a professional PADI (Professional Association of Diving Instructors) Dive Master/Instructor. For those who have never dived before, an onboard Discover SCUBA Diving class is offered for earning credit toward PADI certification. There are also refresher courses available for experienced divers. The Gauguin is fully equipped, including an onboard practice pool, a tank-filling station, and two inflatable dive boats with ladders. Each dive boat holds eight divers and two instructors. SCUBA gear is set up for each diver by the dive staff. Divers depart from the watersports marina of the ship for their dive excursions and return to it after dives. Those who wish to participate in The Gauguin’s dive program will need to bring either proof of certification and a logbook or take a diving course. As a licensed PADI Resort, The Gauguin recognizes divers from all international certifying agencies. For more information about Paul Gauguin Cruises’ dive programs, click here.